Catchment Management Authorities (CMA’s) were established by the State Government to look after land and water resources across a region. The Goulburn Broken CMA (external link) aims to improve the region's social wellbeing, environmental quality and productive capacity in a sustainable manner. From the irrigated Goulburn and Murray valleys, to the dryland grazing and cropping regions as well as high country valued for its tourism and recreational uses, the Goulburn Broken CMA is working to ensure land and water resources are protected and enhanced. 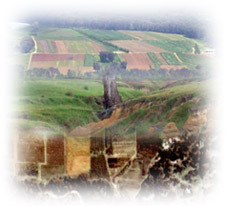 The framework for the delivery of integrated and coordinated natural resource protection program across the whole of the catchment is defined in the Goulburn Broken Regional Catchment Strategy (external link) and Shepparton Irrigation Region Catchment Strategy (external link) - both of which can be downloaded from the Goulburn Broken Catchment Management Authority website. Working with its partners, including Goulburn-Murray Water, Goulburn Valley Water and the Department of Sustainability and Environment, the Goulburn Broken CMA develops detailed strategies to address land and water degradation. Financial Assistance Schemes (external link) are available through the Shepparton Irrigation Region Land and Water Management Plan (SIRLWMP). This Plan is a major component of the Shepparton Irrigation Region Catchment Strategy. On behalf of the Goulburn Broken and North Central Catchment Management Authorities, the Shepparton Irrigation Region Implementation Committee implements the Catchment Strategy which includes the Land and Water Management Plan and other major natural resource management strategies in the Shepparton Irrigation Region. There are ten Declared Water Supply Catchments in the Goulburn Broken region. These are important in terms of supplying water for domestic, irrigation or other purposes. The Ecosystem Services Project is a collaborative natural resource management project that is studying the services that people obtain from their environments, the economic and social values inherent in these services and the opportunities that can arise from considering these services more fully in land management policies and decisions. A full text downloadable version of the former Land Conservation Council's Final Recommendations for the Murray Valley Area (May 1985) is available on the Victorian Environmental Assessment Council website. These provide an ongoing framework for public use of land in the area. Recommendations in the text have been edited to reflect government variations and amendments at the time of approval, and subsequent changes. The recommendations are grouped under major headings, such as Parks, Reference Areas, Wildlife, State Forest, Bushland Reserves and so on. Key recommendations are for Barmah State Park, Warby Range State Park, and the River Murray Reserve. The Victorian Landcare and Catchment Management Magazine (external links) online site of DSE provides copies of all these magazines dating back to 1996.